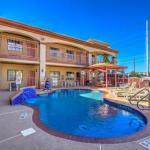 This charming Texas motel is located 4 miles from South Padre Beach and is a 5 minutesâ?? drive from Long Island Village Golf. The motel offers an outdoor pool and rooms with a microwave. Guestrooms at the Casa Rosa Motel are equipped with a small refrigerator. The rooms offer South-western style. Each morning a light breakfast including coffee bagels toast and cereal is served to Casa Rosa's guests. The Casa Rosa is located in central Port Isabel. The South Padre Island Golf Club is 7 miles from the motel.